As usual, I'm running behind - on everything! Writing down my goals didn't seem to help me much so I will just have to muddle through like usual. So first things first. 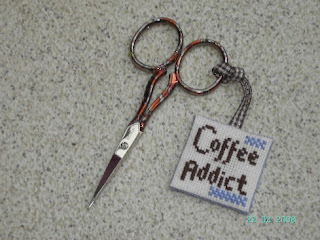 Monique sent me some pictures of the coffee fob she stitched using one of my charts that she has altered to read Coffee Addict. Very cute! I hope you will take time to visit her blog and see the other fobs and projects she has stitched. 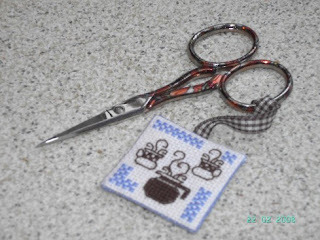 She and I have in common the love of small quick projects and especially scissor fobs! 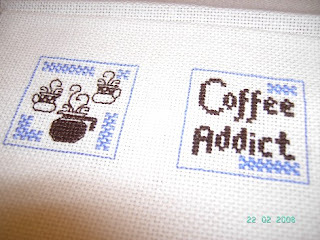 I think I will chart another coffee one using her Coffee Addict idea. I love seeing what stitcher's do with my charts - I like that each one gives their own personal touch to what they do. I have often bought charts just for one little area of the whole design, knowing full well that one little area is all I will stitch. And I love pulling out little motifs, etc and using them on scissor fobs (of course!) 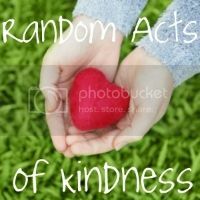 and other small projects. 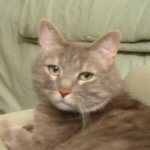 If you have stitched any of my charts, even if you've made changes to suit yourself, whether in the design itself or color changes, I would love to see photos and post them here for others to see. If you hesitate to do so because you are afraid I will be offended because you have changed the design, don't worry! I've been making changes like that since I first started stitching! Ohhh! Way too cool! I'm off to grab some thread and fabric RIGHT NOW. I would like to thank you, Sharon, for this nice chart and for posting the fob. Those are very cute fob designs! Nice work! I've stitched this design 3 times as fobs for gift and exchange and I like this flat version too. Thank you for sharing your design so generously.